If they are safe to work under, why does one need a respirator and a hazmat suit to handle them? 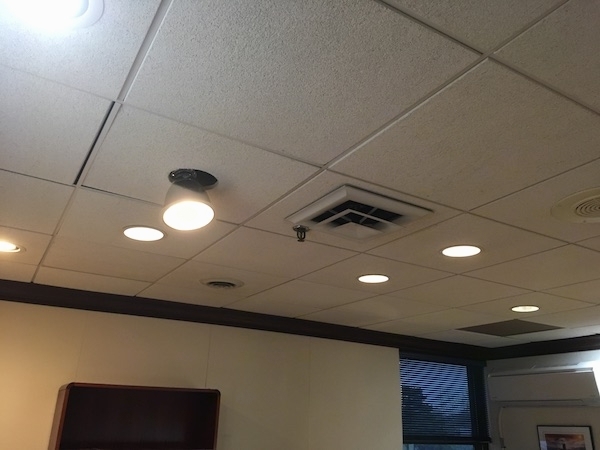 Many office and other commercial buildings have fiberglass ceiling panels above everyones heads. 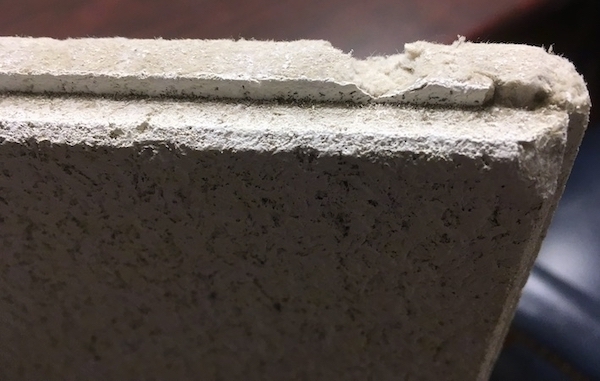 I have gotten pretty good at detecting fiberglass and avoiding it. Because of this my kidney function has returned to normal and overall health has improved. At the office they have been working hard at getting all of the fiberglass out of the building. There was one section where I could feel it, yet no one could find it. The workers had checked behind every wall they could think of in that area. After walking around with the contractors and telling them exactly where I felt it, they found it. 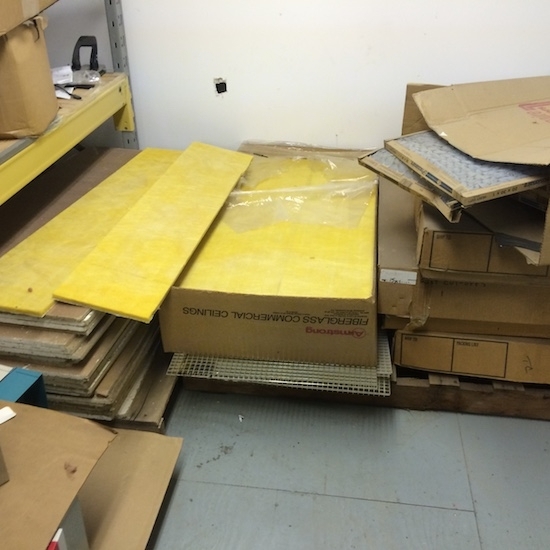 Boxes of fiberglass ceiling panels were placed under the medal rack on the mezzanine. I had felt the fiberglass and the overall sick feeling while standing on the stairwell. The boxes were a couple of feet to the left with a wall in-between. Notice the hole in the drywall where they had checked to see if it was behind the wall. 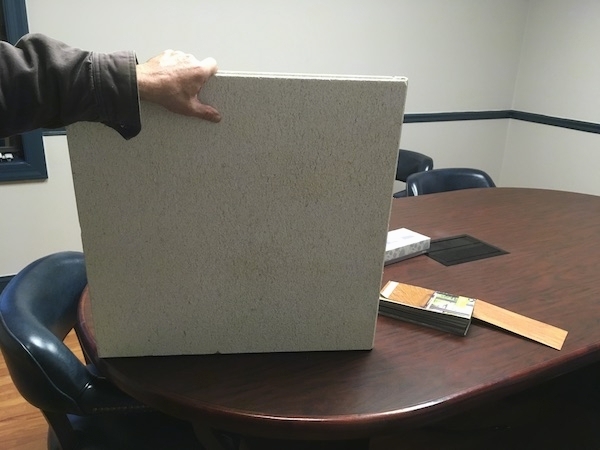 It was not behind the wall, but in the sealed cardboard boxes in front of it. 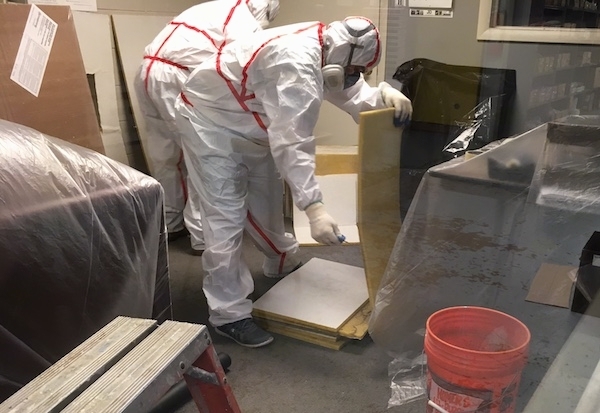 At an office building where it was discovered that a handful of employees were having a reaction to fiberglass the company had been working hard at getting it all removed. There was a meeting with eight people in one of the offices. When someone turned on a fan four of the eight people started having symptoms. 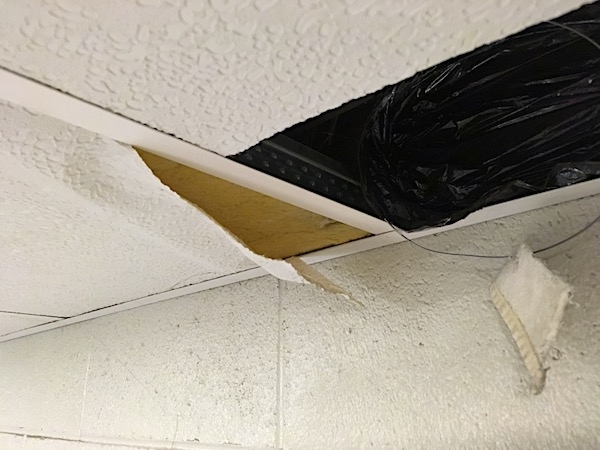 The room was searched and they found that the old ceiling tiles were fiberglass. 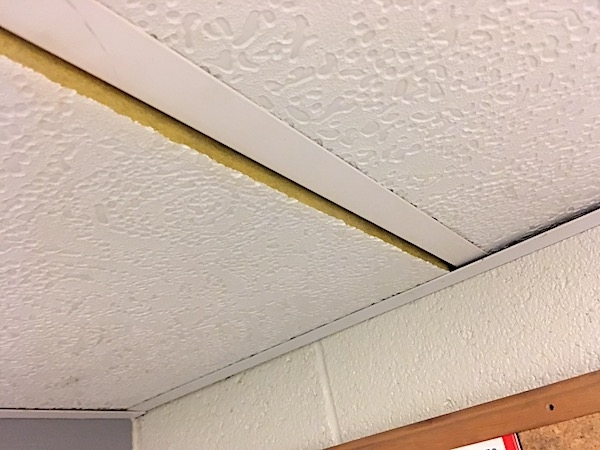 If you look closely at the end of this ceiling tile you can see the glass fibers. The panels are decades old and are slowly breaking down. The glass is shattering and floating around the air and settling on things in the room. When someone turned on a stand alone fan it stirred up the microscopic dust. 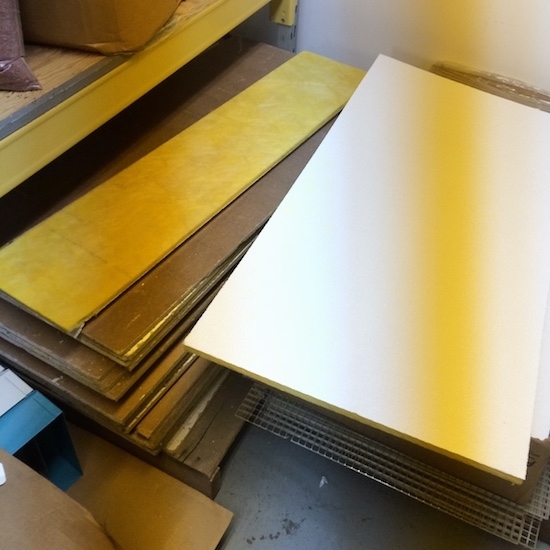 These panels will be removed and replaced with something that does not contain shredded glass. 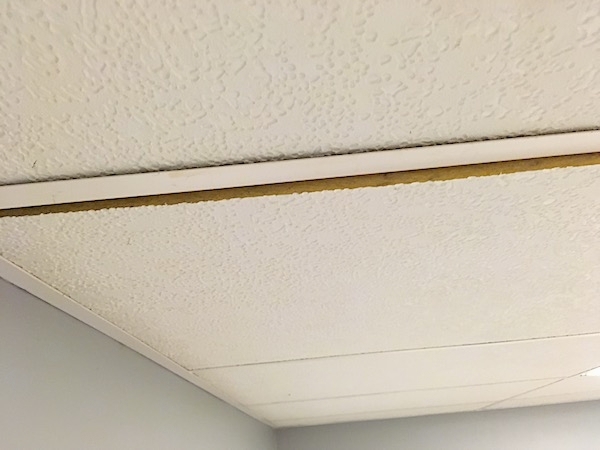 In another office they found fiberglass ceiling panels breaking down becoming airborne. 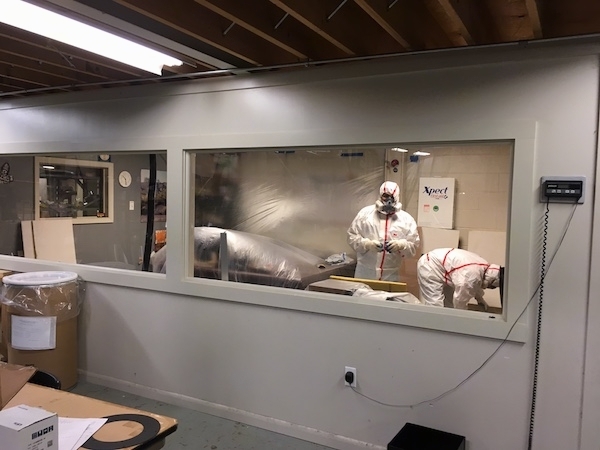 The more air flow in the room the more the particles broke down. They could not be seen without a microscope. The body is unable to break down the glass that is inhaled. 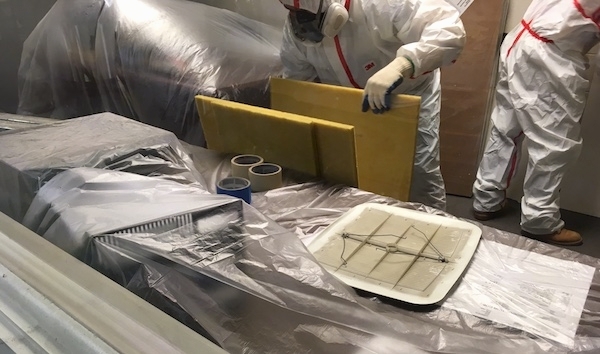 The fiberglass ceiling panels being removed by workers wearing hazmat suits and respirators. An office employee's eyes were burning, teeth felt loose and sinuses were swollen. 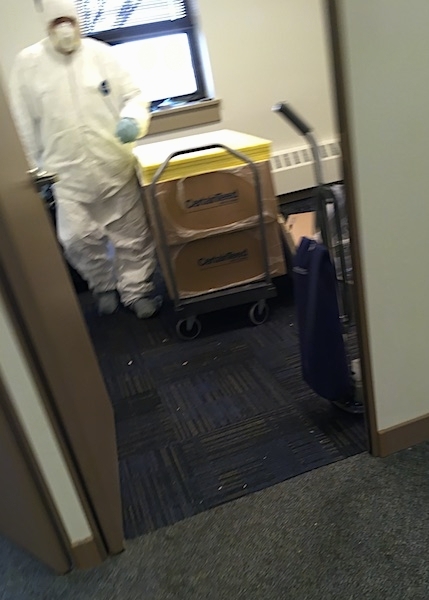 As they walked down the hallway wondering why the air was so poor inside the building they saw this guy, a contractor wearing a hazmat suit (hazardous materials suit), face mask and gloves with a stack of fiberglass ceiling panels next to him. Turned out the office was removing and replacing the fiberglass panels during the work hours. The contractors were all wearing protective gear to handle something the employees had to work under daily. This is another office where the occupant was getting sick while at work. 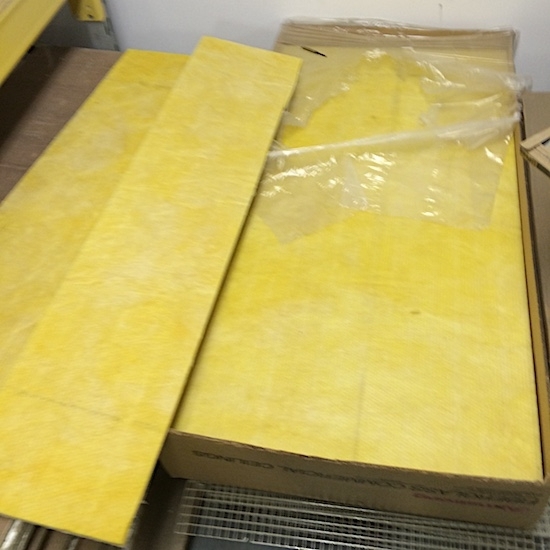 The fiberglass ceiling panels were removed and replaced with panels that do not jeopardize the air quality. The fiberglass ducts are also being removed. 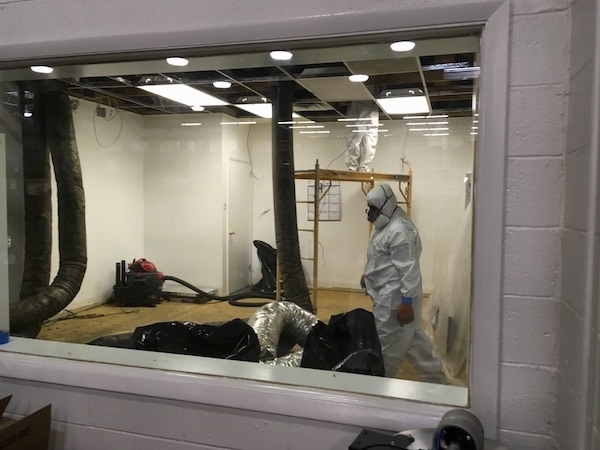 The company is going fiberglass-free as much as possible for the safety and health of their employees.